Following on from my #MySundayPhoto post last week where I vowed to get out of the house more, we decided to go for a walk to feed the ducks despite the fact that it was so cold that I couldn't feel my fingers or toes! The last time C went to feed the ducks was last summer when I was pregnant with E, but he didn't really understand what they were and he was a lot less vocal. This time, he was so excited and kept saying "hello duckies!" I think we'll have to take him up maybe fortnightly as he seemed to really enjoy it. 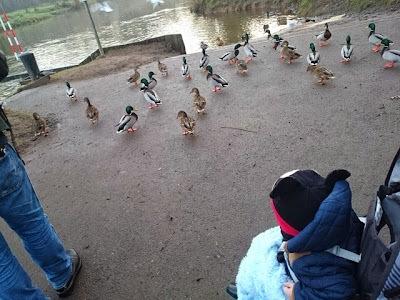 4 comments on "#MySundayPhoto 25/01/2015 - Feeding the ducks"
It looks like loads of fun, I'm glad you all enjoyed your day out.